Print Is Not Dead! - Wood Street, Inc.
We’ve all heard the news: Print is dead. It’s been repeated over and over again throughout the past decade, as newspapers shut down and magazines slashed their staffs to the bare minimum. Yet, despite all the doom and gloom, it’s suddenly refreshingly easy to find print’s defenders. A quick Google search of “Why print isn’t dead” yields more than 38 million results. 2016 saw over 130 new magazine titles launched. Some of the richest men in the world have been buying print media companies. Yes, this is the digital age, and the future lies in digital technology. But if you want your marketing strategy to to be truly effective, think multichannel. Print can still be an extremely effective tool, especially working hand-in-hand with digital. Rather than the “death” of print, what we’re seeing is a rethinking of the medium, a reinvention as it finds its place in a digital world (much like the music and television industries are also doing). And just as vinyl records, a format long-considered to be obsolete, made a comeback with collectors and audiophiles due to their higher quality and engaging format, printed materials can be a great way to reach your customers in a personal and creatively interesting way. Now that everyone has a website (and an email list, and an app, and a social media presence), how do you make your business stand out? Well-crafted, customized print pieces such as flyers, brochures, and even boutique magazines are a great way to do that. By creating your own content and packaging it in an attractive way, you’re immediately taking advantage of all of what makes print a great medium. You’re getting your message literally into the hands of your audience, in a format that research shows they are likely to hold on to and continue to engage with over a much longer period of time than an email or social media post. With print, the stickiness of your message is much higher, as it stays in front of your customers longer, unlike emails or web pages that can easily be clicked past or sent to the trash. Studies continue to show that the average person rarely reads more than a quarter of the text on a web page or targeted email, preferring to scan, whereas magazine readers see 90% of all pages in an issue, and will usually pick up a copy of a magazine more than once per day on multiple days, according to Bauer Media. Direct mail continues to be a viable tool, as research from the US Postal Service shows 85% of customers sort and read their mail on a daily basis, with 40% trying new businesses as a result of direct mail marketing. Print is a powerful tool, but just like any tool, it must be used correctly to achieve the best results. So how can you make it work for you? The vinyl comparison is an apt one here: Everyone can download a digital song these days, and the ease and portability have made that a popular and successful format. Yet, many music lovers still appreciate the experience of vinyl. There’s something special about removing a record from its sleeve, placing it on the turntable, seeing album art at a larger size, and enjoying the higher level of sound quality that vinyl offers. This is the type of specialized, tactile experience you should be aiming to create for customers with your printed materials. By placing a keepsake item into the hands of your audience, you are engaging them in a much more personal manner than blasting them with an email, and in a way that lets you stand out from your competition. The key to this is knowing your audience and making sure you target the content to them. Vague and generic content that’s intended to appeal to everyone usually ends up appealing to no one. You know your business, and you know who your customers are and what they like. An effective message will speak to them on a personal level, and a subject that interests them will ensure their frame of mind will be a receptive one as they read. Don’t limit your content to just your product or message. Use this format to create something that speaks to their lifestyle and interests, and then show them how your product fits into their life. Customizing the design is another way to make your printed pieces stand out. The more personalized you can make your them, the more powerful they will be. Consumers are smart enough to recognize the difference between an generic template and a customized design. As a consequence, they will feel special in relation to your business if they see and appreciate the time and effort taken to personalize your marketing. An experienced graphic design firm can assist you in choosing paper stock, typefaces, and photography and illustration. This will set your printed pieces apart. If the customer recognizes that you have given them something special, a keepsake item that speaks to their interests, they tend to be more likely to hang on to that item and engage with it over a longer period of time. Finally, a printed piece can always be used to drive your customers to your digital presence. Including your website URL, Facebook page, Twitter handle, and other social media information on printed materials has become standard operating procedure in recent years. 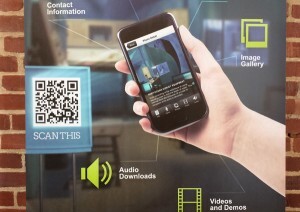 With the proliferation of QR codes, your customers can use their web-enabled devices to directly link your printed material with digital. You can also spread the reach of a marketing campaign wider by cross-promoting the campaign on both print and digital platforms. It may no longer be the dominant force that it once was, but the death of print has been greatly exaggerated. Printed materials are still a viable method of reaching your customers, and should be a key part of your marketing strategy. A well-crafted, customized print campaign can win you new customers while enhancing and supporting your digital presence at the same time. Mike Leister founded Lighthouse Rocket Design, a studio specializing in publication design, brand identity and information visualization, in Frederick, MD in 2012. Mike has been a designer, art director, creative director, and visual storyteller for nearly 20 years for magazines including ESPN The Magazine, Washingtonian, 5280: Denver’s Magazine, Indianapolis Monthly, and Sports Illustrated. His work has been honored by the City & Regional Magazine Association and the Society of Publication Designers.